I joined a local Laborers union a year after I got out of jail. that same union sponsored truck driving classes, for free. you had to complete the classes within 6 months (that includes test and the actual driving test) or else you would have to pay for the school yourself. I completed it. I've had my license for 2 years going on 3 now. I been out of Jail for 6 years and off of probation for 8 months and it seems like everything is good. But I haven't applied at any trucking company. 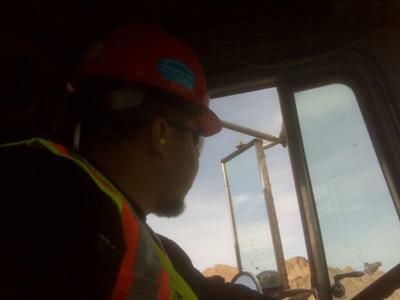 I like driving out of the Laborers union because its always on a construction site, of course I get on the road and highways with other rigs when I'm delivering dirt or concrete or even water. But now I would like to get an Endorsement that I might not be able to get.. I want to obtain the Hazmat endorsement so that I can drive a truck that fuels all the equipment we use at the job sites. Point is you can drive Rigs if your a felon but like the article said "It is going to take some work on your part." to look for places where your background isn't looked at closely. From my point of view it is a place to start if your background is not good. Theirs always a teamsters union. Leasing your own Rig. A friend of a friend.. I have a question. how long would I have to wait to get my hazmat endorsement if I cant get it yet? Out of jail 6 years off of probation 8 months. Thank you. Comments for Felon truck driver. Its been 12 years now since my release. I was able to get my hazmat endorsement. My only biggest mistake has been not going for it. I think about stuff to much took me forever to apply for a Hazmat endorsement. You really do have to start from the bottom to get to the place where you want to be. I have found out that having a bad background your gonna have to show an employer that your trustworthy. once you get that trust from an employer things will start changing by having more responsibilities. nice shifts. I just got my CDL license and im a felon. Who will hire me? Good advise. Just goes to show where there is a will there is a way. Stop sitting on the porch waiting for a job to come to you and get out there an start aggressive looking for a job. Think outside the box.